The blue color scheme is meant to evoke a sense of tranquility. So far, blue has been the most popular color for online reservations at the soon-to-open Angad Arts Hotel. Looking for a romantic getaway? Or maybe you just want to go somewhere to relax and unwind? 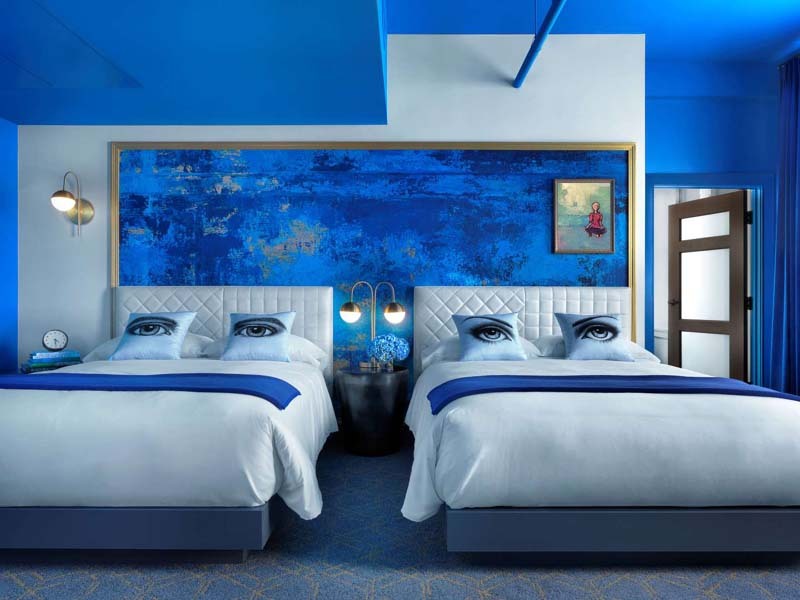 A new hotel in St. Louis aims to match travelers' moods with the type of room they get, and it's all based on color. Red rooms are for passion. Blue for tranquility. Need rejuvenating? Go green. For happiness, surround yourself in sunny yellow. Each room's all-in color scheme goes beyond the paint on the walls, right down to the hue of the drapes and throw pillows, and the shade of the rubber duck in the bathtub. "We thought, 'Why not give guests the opportunity to tailor their experience by booking the room around the emotion of color?' " said Steve Smith, co-developer of the Angad Arts Hotel. "It hadn't been done before." The 146-room property opened this month in St. Louis' Grand Center Arts District in Midtown, roughly three miles west of the Gateway Arch. 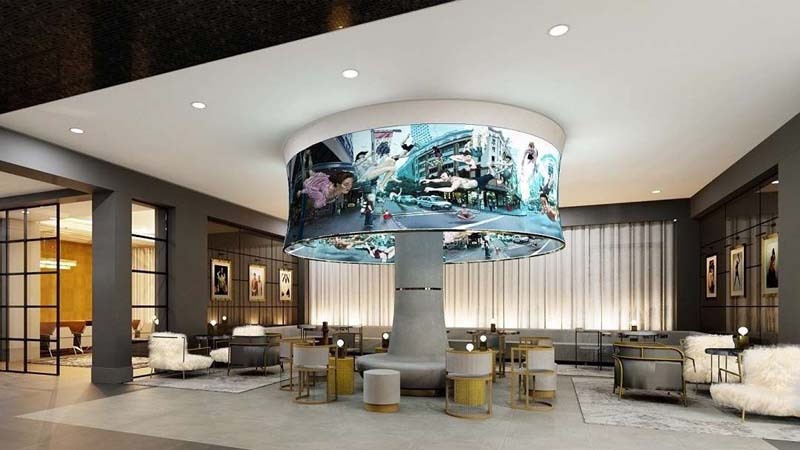 It's an area flush with performance venues, museums and galleries, and the artsy hotel was designed to fit right in with the neighborhood's creative vibe. A 14-foot-tall sculpture of stacked suitcases greets guests as they enter through the back of the building under a fire escape. ("Everything we do here is unconventional," Smith said.) The ground-floor lobby doubles as an art gallery featuring local works for sale, as well as a permanent exhibit dubbed "Behind Closed Doors." 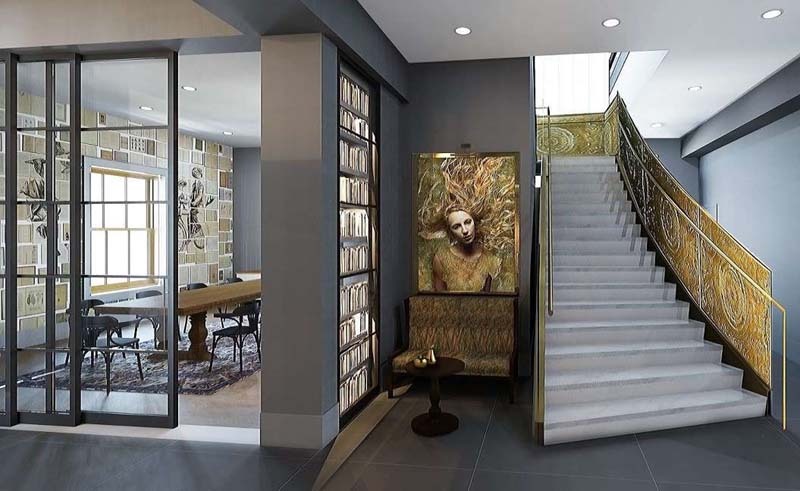 The Angad Arts Hotel is slated to open Nov. 1 in St. Louis. It's designed to be a showcase for all kinds of art, from paintings to performances. "We have 24 doors in kind of a Mondrian pattern," Smith explained. "About half the doors open, and behind them are individual art exhibits that might be something other than a painting - call it an artistic surprise. It might be something from a fashion designer, a poem, a set of headphones to listen to music from one of the recording studios in St. Louis, or goggles you put on for a virtual reality experience. We want to give artists of all persuasions a chance to showcase their work." They also want to give guests a chance - many chances - to showcase the Angad on social media. "We imagined very consciously throughout the design process, where are our Instagram moments?" Smith said. "The 44 pieces of luggage stacked 14 feet high - we think people will be Instagramming that. We were constantly thinking, where will people want to share their experience with their friends?" One such place is bound to be the Angad Playhouse, a purple room stocked with musical instruments. Hotel guests and the public can grab a banjo or violin off the wall and start jamming. The musical playground is perched on top of the building, on the 12th floor, along with the Rainbow Terrace bar, serving cocktails and small plates. Famed New York City chef David Burke oversees the food and beverage offerings at the Angad, where Burke is debuting his first St. Louis restaurant, Grand Tavern. The top floor is where you'll find the hotel lobby. Decked out in white and gold accents, the contemporary space is anchored by a 12-foot-tall "chameleon lamp." Ever-changing video art covers the massive lampshade, a 360-degree projection screen. Decidedly modern and cutting-edge inside, the building itself is a historic property nearly a century old. Formerly known as the Missouri Theatre Building, the long-vacant structure once housed a 3,500-seat venue for vaudeville acts and movies. It's where a chorus line of dancers known as the Missouri Rockets got their start before legging it to New York to become the Radio City Rockettes. The auditorium portion of the building is long gone. The Lawrence Group, where Smith is CEO, bought the remainder in late 2013 for $3.6 million. Five years and about $62 million later, the St. Louis native was ready to raise the curtain on the property he developed along with Britain's Lord Swraj Paul, whose late son, Angad, is the hotel's namesake. Ever-changing video art gets displayed on a 360-degree screen on the "chameleon lamp" in the hotel lobby. "When this project started in 2014, Angad was my partner and co-visionary," Smith said recently. "He passed away in November of 2015. We thought we'd memorialize his name. And the acronym is AAH. We like that expression." This hotel marks the second for Smith, whose Lawrence Group partnered with St. Louis University in 2011 to open Hotel Ignacio, a 51-room boutique property about three blocks away. The Angad boasts nearly three times as many rooms, 38 of which are suites. Another 25 are extended-stay lodging with kitchenettes. Room sizes range widely, from "small" (230-280 square feet with a queen or king) to a 380-square-footer with a pair of bunk beds and a 1,400-square-foot, two-bedroom grand suite. Some rooms can be had for as little as $95 with an introductory, online-only "Red Hot Rate" good through March 31. Hotel prices can fluctuate wildly, but Smith expects the average nightly rate will settle in around the low $200s. So far, blue is shaping up to be the color most in demand for online reservations, Smith said. "It's a safe choice; it's tranquil," he said. "What's interesting is when we give tours of the hotel, yellow is probably the color most people have been least inclined to initially. But when you walk them into the room, you get a visually positive reaction, a 'Wow, this is really neat.' "
Smith credited the concept of booking a room by color to the hotel's executive managing director, David Miskit. A veteran of the boutique lodging world, Miskit long worked for hotel and nightclub impresario Ian Schrager. His resume includes stints managing New York City's legendary Studio 54 in the '80s and, more recently, the former Public hotel in Chicago's Gold Coast. At the Angad, Miskit's to-do list includes curating surprise pop-up experiences throughout the property. "On any given evening, a local dance troupe might create a 'Dirty Dancing' performance, unannounced," Miskit said in press materials about the hotel. "Or the lobby lights might dim, and a student from the Grand Center Arts Academy across the street might walk in and sing an aria." Said Smith: "One of our mantras is 'stay colorful.' That's not only visual, with the colors, but also personalitywise. Being colorful. It's what this hotel is about."